Voodoo Lab Wahzoo pedal - a Wah and more! 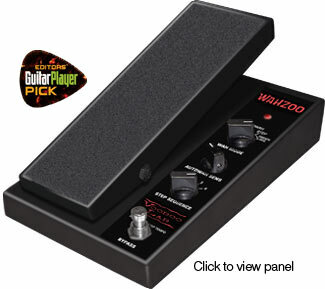 WAHZOO™ is the most versatile wah ever. Combining the finest classic wah tones, a funk-approved Autowah, our unique programmable Stepwah, and true bypass via gold contact relay, Wahzoo delivers all the sounds you’ve been looking for and more! Delivers all the clarity and expressiveness of the classic, highly sought after, Clyde McCoy signature wah. You’ll immediately notice the throw, taper, and feel to be inherently vocal and musical. In CREATE SEQ mode, you design rhythmic patterns of up to 30 wah positions. Switch to STEP, and WAHZOO auto-magically steps through your sequence. You can store 4 custom sequences of your own creation. Plus you can use the treadle to sweep from slow to ultra-fast tempos on the fly. Whether you’re looking for the ultimate wah, or want to go deep into uncharted territory, Voodoo Lab delivers versatility and tone up the WAHZOO. People really seem to like them!